…is described as hyperirritable spots in skeletal muscle that are associated with palpable nodules in taut bands of muscle fibers. Among MDs, many specialists are well versed in trigger point diagnosis and therapy. These include physiatrists (physicians specializing in physical medicine and rehabilitation), family medicine, and orthopedics. 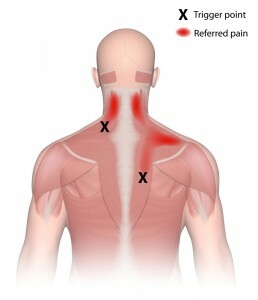 Osteopathic as well as chiropractic schools, however, include trigger points in their training. Other health professionals, such as occupational therapists, physiotherapists, acupuncturists, massage therapists and structural integrators are also aware of these ideas and many of them make use of trigger points in their clinical work as well.